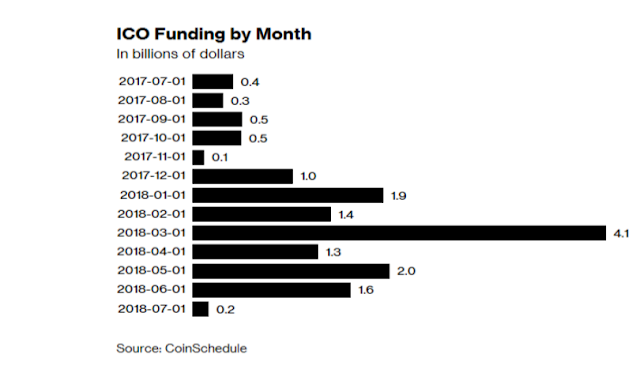 The main problem is that many of these ICO companies are start-ups supposedly raising fund to develop and build the platform and the related infrastructure for implementation and roll-out. As Bloomberg puts it “most ICOs were raising money without having an experienced development team or an actual product, just white papers studded with promises.” So most of these start-ups do not have users or participants supporting their cryptocurrency yet. Business 101 is very clear - A business is doomed to fail if there is not enough customer using your product. In addition, the cryptocurrency frenzy in recent years has floated the coin industry to the radar screen of many government and regulatory agencies. There are 130 cryptocurrency-related Investigations ongoing at FBI. A supervisory special agent of FBI admitted this is just “a small sliver at this point.” Contrary to one of the much touted benefits of digital coins – trackable (albeit anonymous) transactions on a permanent internet-based leger, FBI also noted how the technology of digital-currency payments have facilitated an increase in illegal activity such as drug trades, human trafficking, kidnapping and ransomware attacks. Perhaps millennials need to rethink if the anonymous "feature" of cryptocurrency is really that cool? The most promising part of the cryptocurrency technology is blockchain. Quite a few hitched the up train by simply changing their names to contain the term "blockchain" or by a mere announcement that exploring blockchain is part of the current "growth strategy". But even blockchain has not done that well either. according to CB Insights, only 2% of the blockchain startup companies went on to a fourth round of funding compared with 14% of the tech companies. In addition, the cryptocurrency frenzy in recent years has floated the coin industry to the radar screen of many government and regulatory agencies. There are 130 cryptocurrency-relatedInvestigations ongoing at FBI. A supervisory special agent of FBI admitted this is just “a small sliver at this point.” Contrary to one of the much touted benefits of digital coins – trackable (albeit anonymous) transactions on a permanent internet-based leger, FBI also noted how the technology of digital-currency payments have facilitated an increase in illegal activity such as drug trades, human trafficking, kidnapping and ransomware attacks. Perhaps millennials need to rethink if the anonymous "feature" of cryptocurrency is really that cool?